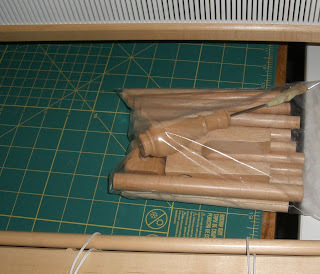 My loom arrived Wednesday after I returned from a long day of work that included a a trip to Montgomery. When I got home I was already tired. But I was excited about the loom. I planned to open it up, string it with warp threads and start weaving. Silly me! The box was my first surprise. "Hey, it is not very big" Oh, I thought, it must be folded. Ha. Silly me. Can you say assembly required? Yeah, great. Ha ha. I opened the box and saw lots of pieces wrapped neatly in brown paper. I started unwrapping. (It is a shame I didn't take pictures - chalk that up to being tired.) There was also a stapled set of instructions. The good news is that they were well written. Several times I when "Huh?" but then kept reading and my question was answered. 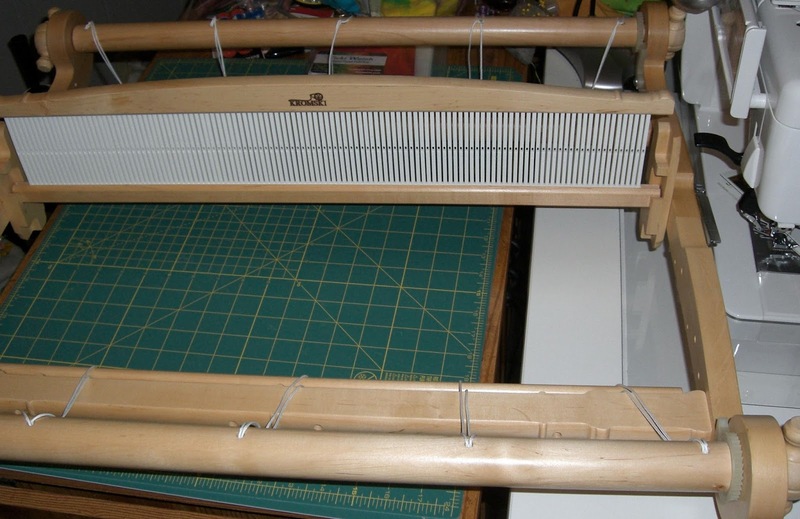 Seriously, there were not two single pieces of work already joined except for the heddle. I did take pictures after it was together. Here is the heddle along with the shuttles which hold your weft threads. 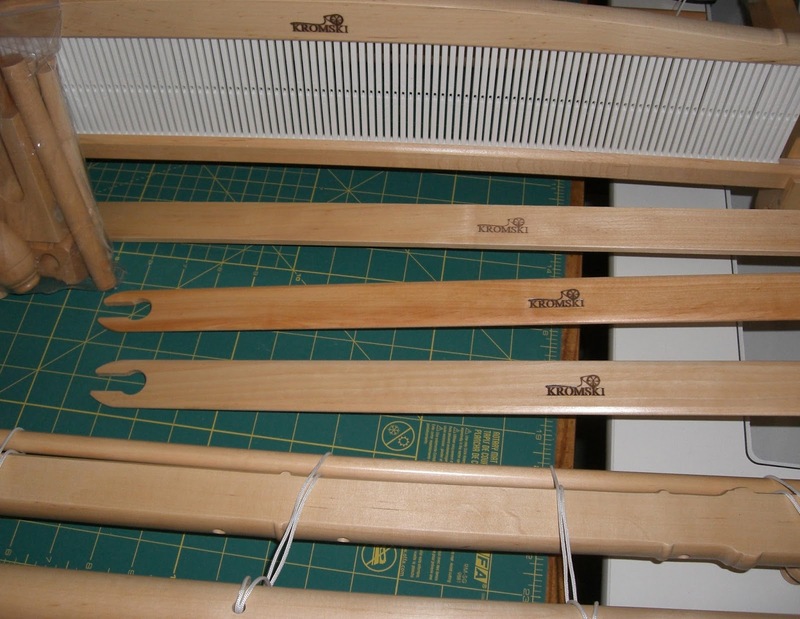 That stick in the back just in front of the heddle is a "pick up stick." 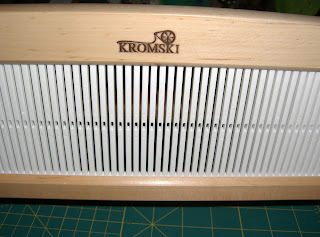 It is a tool for doing patterns in your weaving. 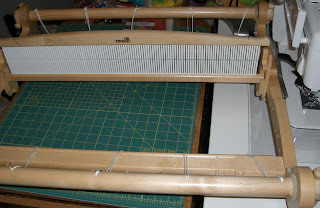 In the plastic bag are warping pegs, since this loom can also be used as a warping board. There is also a heddle threading hook and a warping helper. 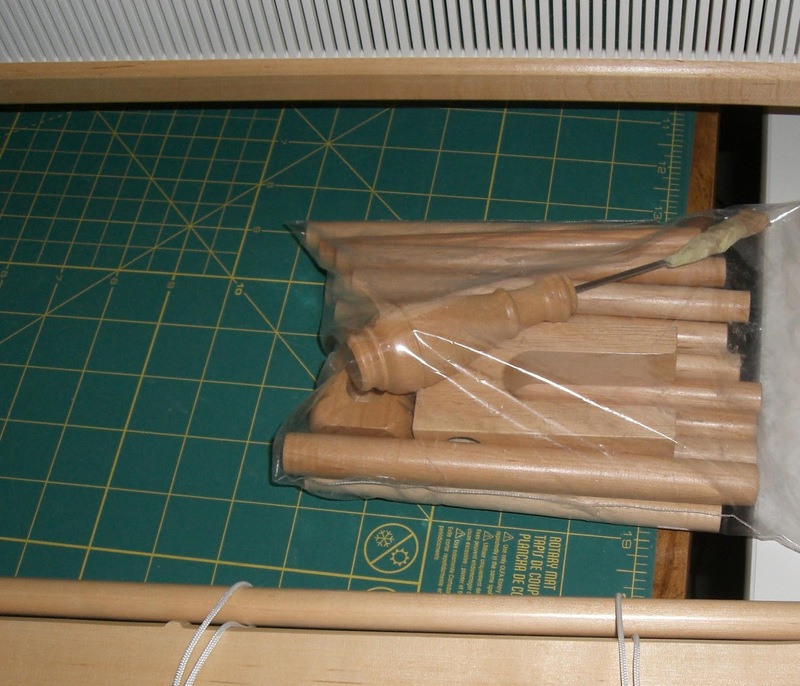 And here is the loom put together just waiting to be warped. Then the weaving can begin. But, I am writing this on Wednesday night after a long day, now I want to go to bed! The weaving will wait a day or two. Wow! I am so glad you are doing this (instead of me), lol! I am overwhelmed just reading your post with strange words. But I know it's a learning curve you will master, and I look forward to the results. So, am I going out to buy a loom? Well, I think it's very pretty, but probably not yet, especially after reading your post. ;) I will admit, I'm duly impressed you put it together already, and at the end of a long day! I know what you will be doing this weekend! Heddles, warping and wefts leave me muddled, twitching and ditzy........I'll wait to watch your creations come by Gene with much excitement! I am looking forward to seeing how tha is done. I have always wanted this type of loom but am scared to venture into it since they are not cheap. Can you use fabric or strictly yarns? Your loom looks pretty good Gene....I would have hated to put it all together.....looks like lots of pieces! Oh wonderful Gene....can't wait to see what you create. I'm sure it will be a work of art!! We'll have to go on a learning trip together with this loom. Didn't know any of the terms you used = but I'm sure we will learn as you show us your progress. I'm excited for you and can't wait to see your first creation. I know it probably won't be perfect, but it will be cool to see your progress. Maybe someday you'll inspire me to get my own loom! You are going to love weaving. I like to make rugs using recycled t-shirts. simple and easy fun! can't wait to see your first complete project. 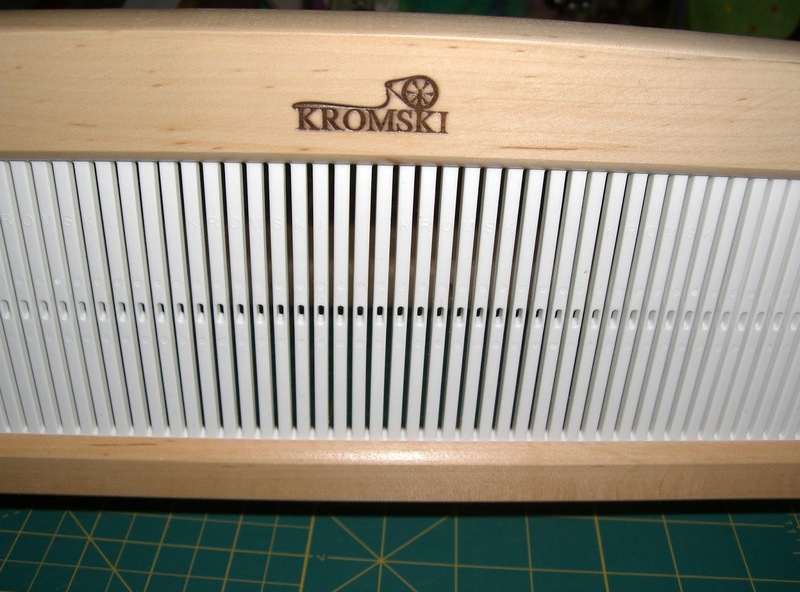 I have been following your weaving adventures and have looked into a Kromski loom. Did you buy the 24" loom and can you tell me where you purchased it. I thought you might have a dealer preference.